S69-34329 (13 May 1969) --- The prime crew of the Apollo 10 lunar orbit mission sits for photograph while at the Kennedy Space Center for preflight training. Left to right are astronauts Eugene A. Cernan, lunar module pilot; John W. Young, command module pilot; and Thomas P. Stafford, commander. 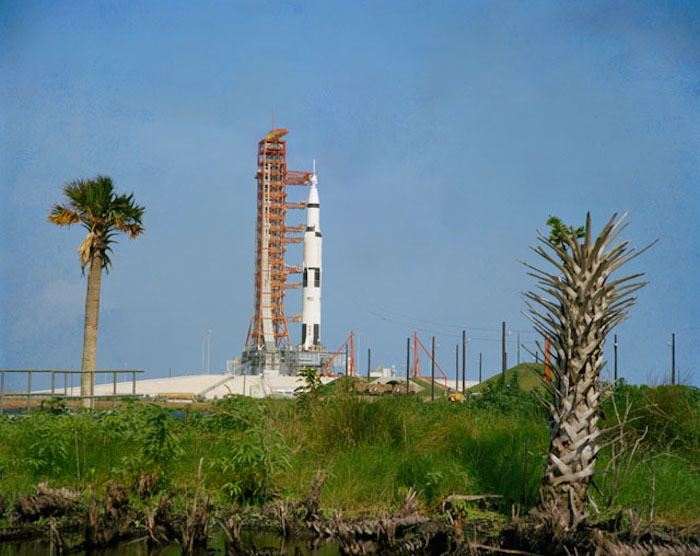 In the left background is the Apollo 10 space vehicle on Pad B, Launch Complex 39, Kennedy Space Center. The three crewmen had just completed a Countdown Demonstration Test exercise. S69-34328 (17 May 1969) --- Ground level view of the 363-feet tall Apollo 10 (Spacecraft 106/Lunar Module 4/Saturn 505) space vehicle on Pad B, Launch Complex 39, Kennedy Space Center. 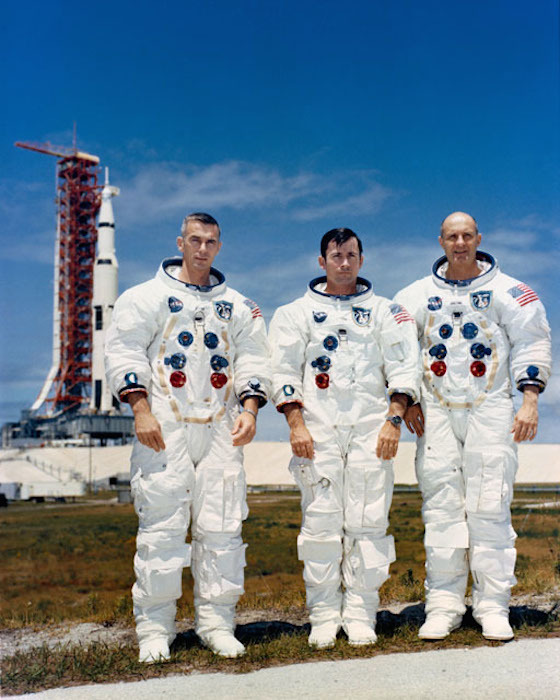 The Apollo 10 crew will be astronauts Thomas P. Stafford, commander; John W. Young, command module pilot; and Eugene A. Cernan, lunar module pilot. S69-34327 (13 May 1969) --- Aerial, high-angle, view of the Apollo 10 (Spacecraft 106/Lunar Module 4/Saturn 505) space vehicle at Pad B, Launch Complex 39, Kennedy Space Center, Florida. The crew of the Apollo 10 lunar orbit mission will be astronauts Thomas P. Stafford, commander; John W. Young, command module pilot; and Eugene A. Cernan, lunar module pilot. 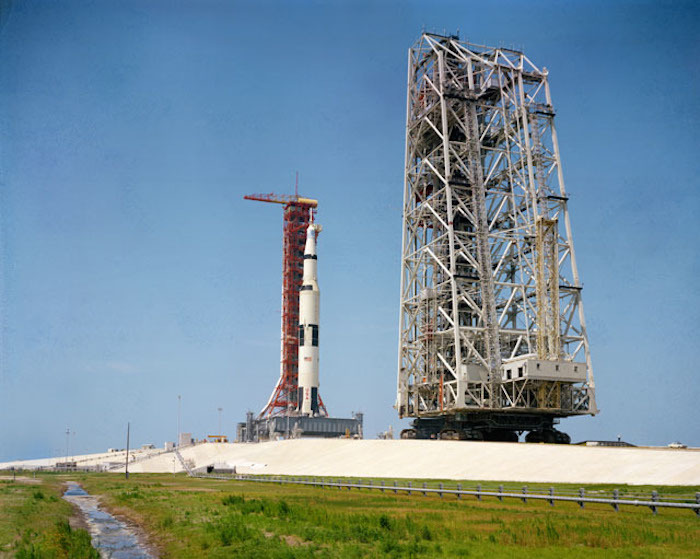 S69-34320 (17 May 1969) --- Ground level view of the 363-feet tall Apollo 10 (Spacecraft 106/Lunar Module 4/Saturn 505) space vehicle on Pad B, Launch Complex 39, Kennedy Space Center. The service structure is in the right foreground. The crew of the Apollo 10 lunar orbit mission will be astronauts Thomas P. Stafford, commander; John W. Young, command module pilot; and Eugene A. Cernan, lunar module pilot. S69-33854 (4 May 1969) --- Aerial (high-angle, clasp) view of the Apollo 10 (Spacecraft 106/Lunar Module 4/Saturn 505) space vehicle on Pad B, Launch Complex 39, Kennedy Space Center. 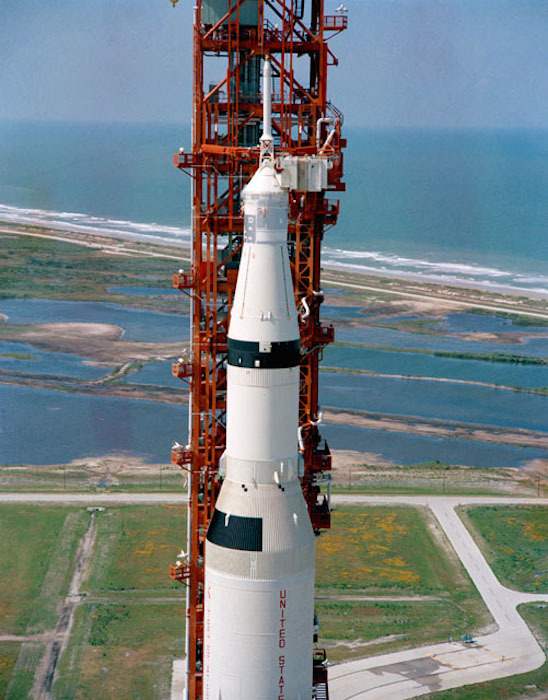 This photograph of the 363-feet tall Apollo/Saturn V stack was taken during pull back of the mobile service structure. 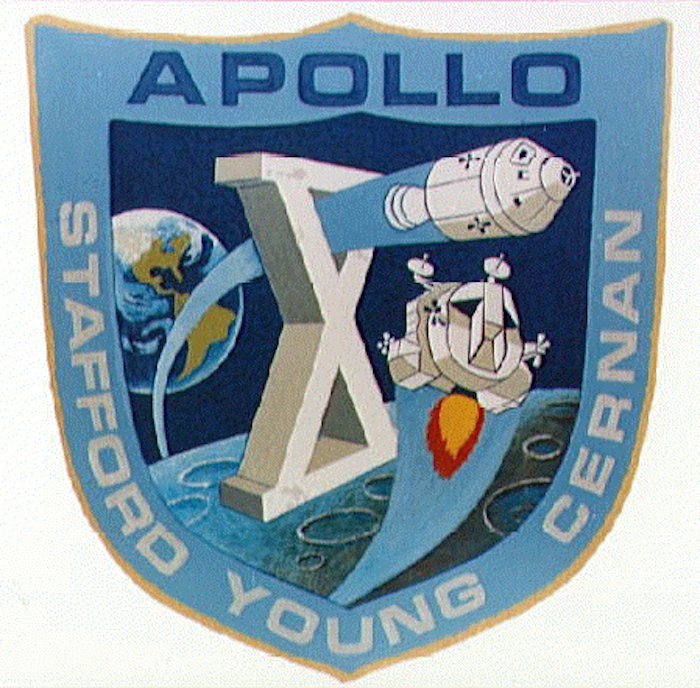 The Apollo 10 crew will be astronauts Thomas P. Stafford, John W. Young, and Eugene A. Cernan. 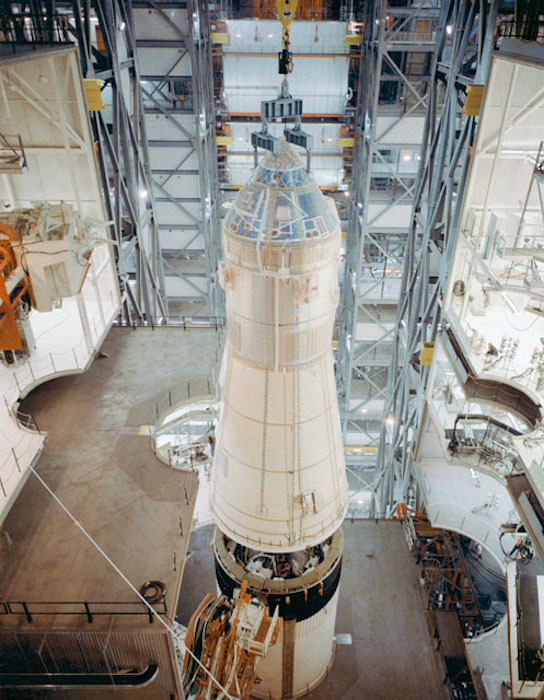 S69-19203 (6 Feb. 1969) --- High-angle view in Hi-Bay 2 of the Kennedy Space Center's (KSC) Vehicle Assembly Building (VAB) showing Apollo Spacecraft 106 Command and Service Modules being moved into position for mating to the Saturn 505 launch vehicle. S69-19197 (1969) --- Interior view of the Kennedy Space Center's (KSC) Manned Spacecraft Operations Building (MSOB) showing Apollo Spacecraft 106 Command and Service Modules (CSM) being moved to integrated work stand number one for mating to Spacecraft Lunar Module Adapter (SLA) 13. 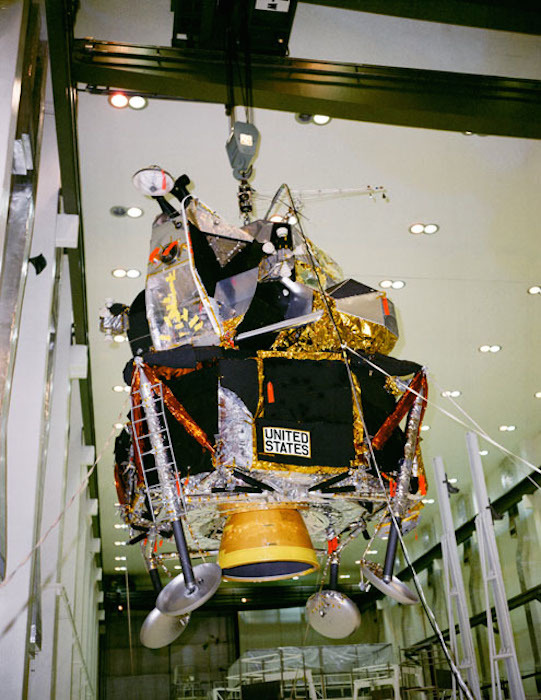 Spacecraft 106 will be flown on the Apollo 10 (Lunar Module 4/Saturn 505) space mission. 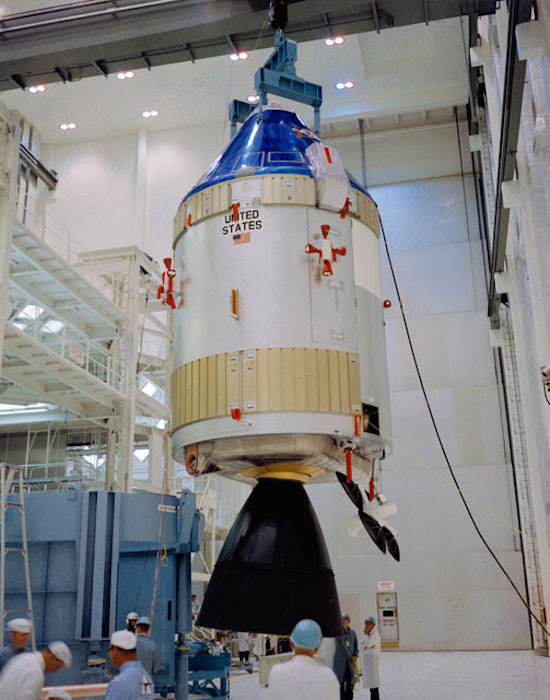 S69-19190 (31 Jan. 1969) --- Interior view of the Kennedy Space Center's Manned Spacecraft Operations Building showing Apollo Spacecraft 106/Command/Service Module being moved to integrated work stand number one for mating to Spacecraft Lunar Module Adapter (SLA) 13. 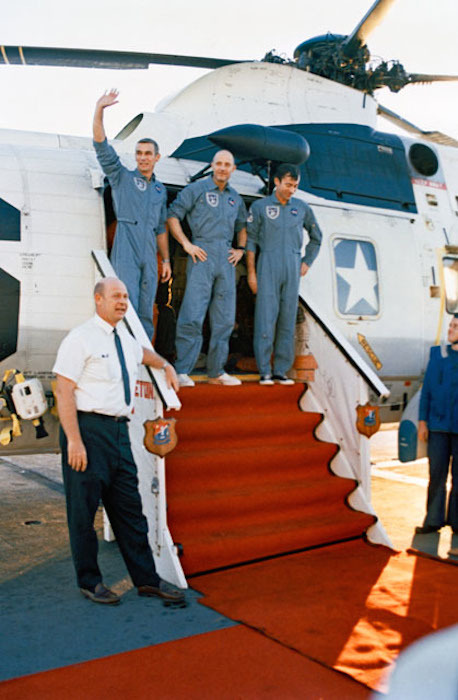 Spacecraft 106 will be flown on the Apollo 10 (Lunar Module 4/Saturn 505) space mission. S69-17810 (13 Jan. 1969) --- Lunar Module 4 being moved for mating with the Spacecraft Lunar Module Adapter in the Kennedy Space Center's (KSC) Manned Spacecraft Operations Building. Lunar Module 4 will be flown on the Apollo 10 (Spacecraft 106/Saturn 505) lunar orbit mission. 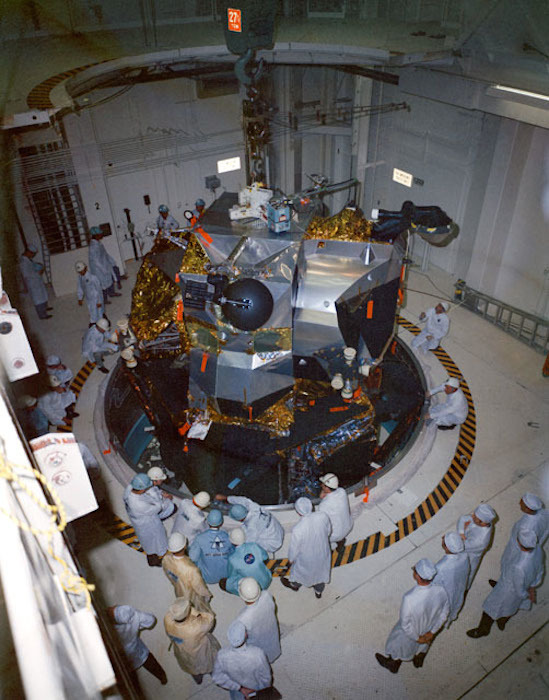 S69-17807 (13 Jan. 1969) --- Lunar Module 4 in the Kennedy Space Center's Manned Spacecraft Operations Building being moved into position for mating with Spacecraft Lunar Module Adapter (SLA) 13. 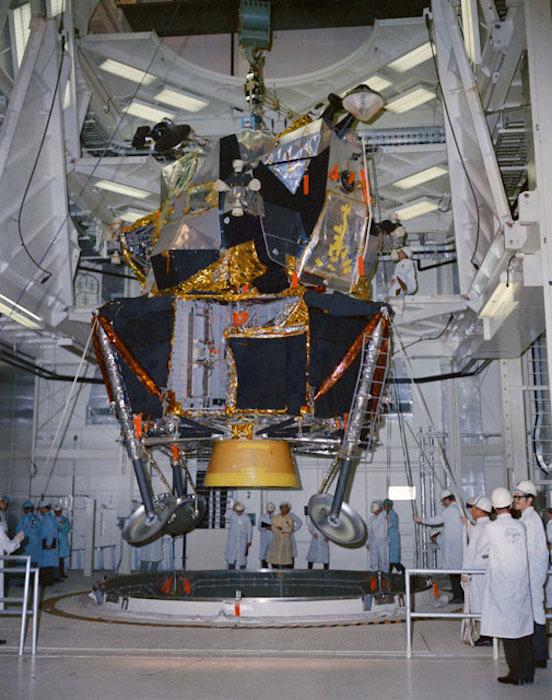 Lunar Module 4 will be flown on the Apollo 10 (Spacecraft 106/Saturn 505) space mission. S69-17809 (13 Jan. 1969) --- Lunar Module 4 in the Kennedy Space Center's Manned Spacecraft Operations Building being moved into position for mating with Spacecraft Lunar Module Adapter (SLA) 13. 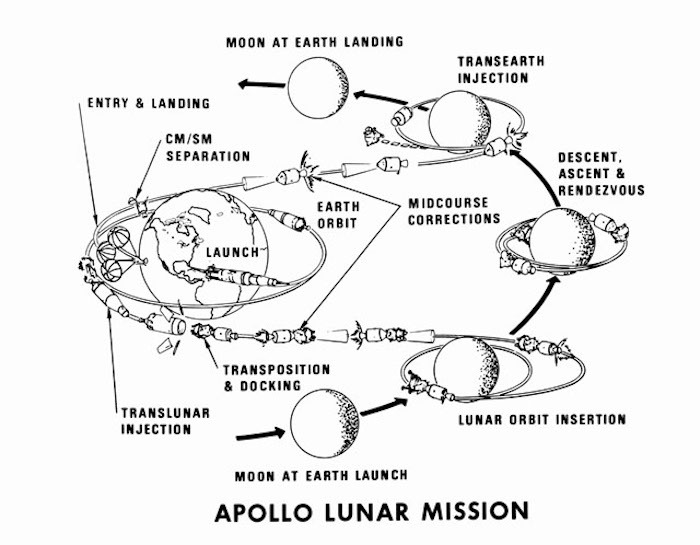 Lunar Module 4 will be flown on the Apollo 10 (Spacecraft 106/Saturn 505) lunar orbit mission. 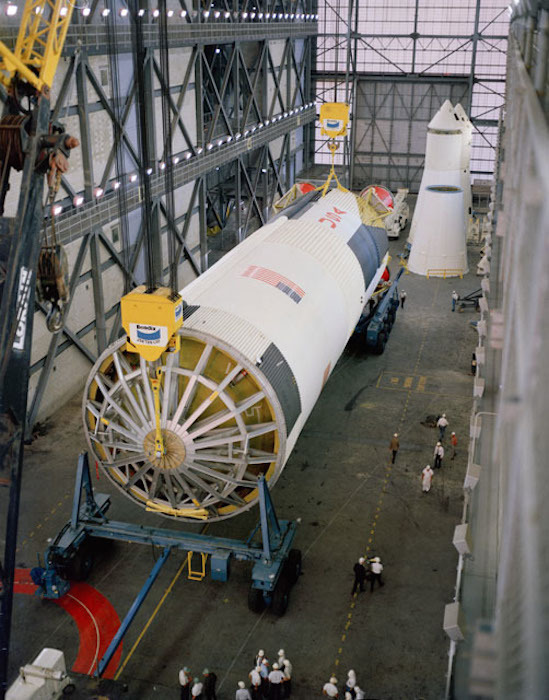 S68-55034 (3 Dec. 1968) --- The first (S-1C) stage of the Saturn 505 launch vehicle being prepared for erection in the high bay area of the Kennedy Space Center's (KSC) Vehicle Assembly Building (VAB). 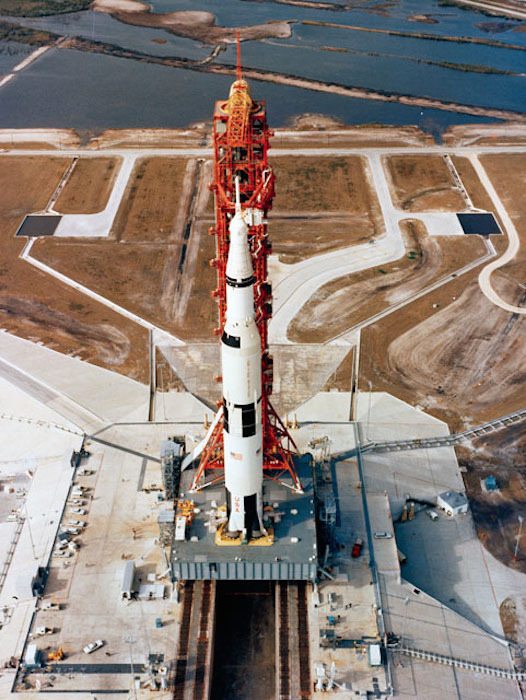 Saturn 505 is the launch vehicle for the Apollo 10 mission. 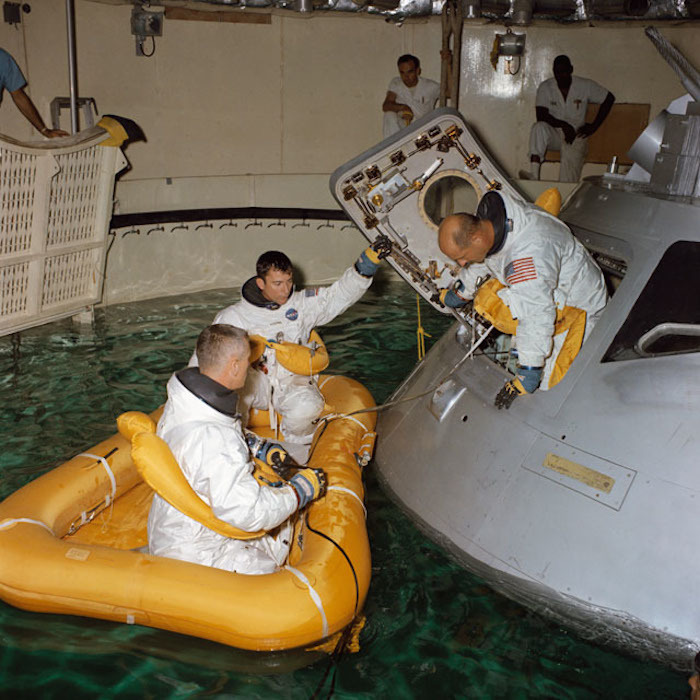 S68-41685 (August 1968) --- Three astronauts participate in Apollo water egress training in a tank in Building 260 at the Manned Spacecraft Center. Egressing the Apollo Command Module trainer is Thomas P. Stafford. 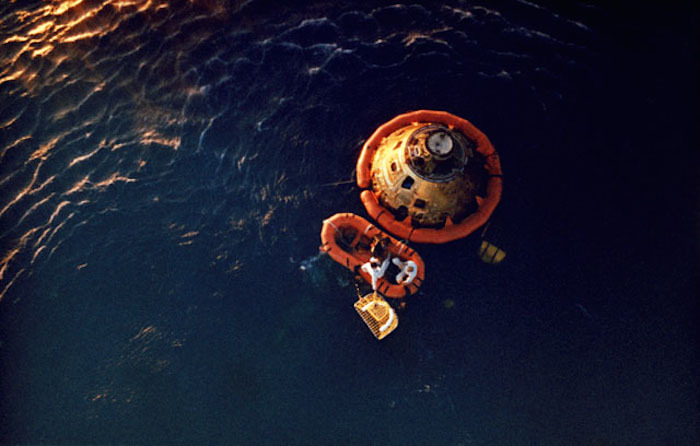 Already in life raft are Eugene A. Cernan (in foreground) and John W. Young. S69-34073 (1969) --- An illustration showing a mission profile of a lunar orbit flight by the National Aeronautics and Space Administration. 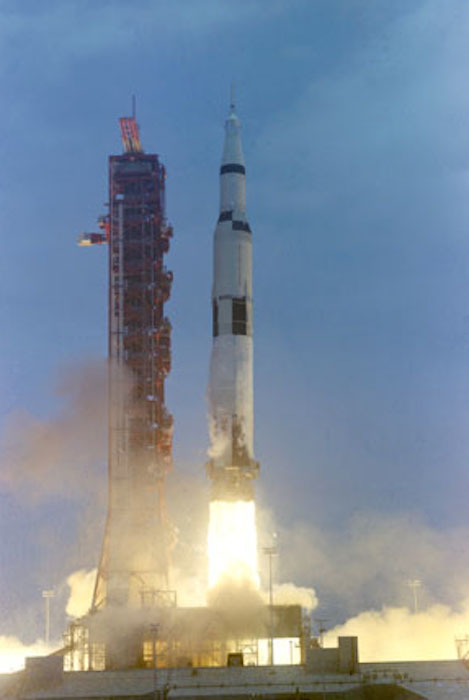 S69-34143 (18 May 1969) --- The Apollo 10 (Spacecraft 106/Lunar Module 4/Saturn 505) space vehicle is launched from Pad B, Launch Complex 39, Kennedy Space Center at 12:49 p.m. (EDT), May 18, 1969. Aboard the spacecraft are astronauts Thomas P. Stafford, commander; John W. Young, command module pilot; and Eugene A. Cernan, lunar module pilot. The eight-day, lunar orbit mission will mark the first time the complete Apollo spacecraft has operated around the moon and the second manned flight for the Lunar Module. Two Apollo 10 astronauts, Stafford and Cernan, are scheduled to descend within eight nautical miles of the moon's surface in the LM. S69-34144 (18 May 1969) --- The Apollo 10 (Spacecraft 106/Lunar Module 4/Saturn 505) space vehicle is launched from Pad B, Launch Complex 39, Kennedy Space Center, Florida at 12:49 p.m., May 18, 1969. Aboard the spacecraft are astronauts Thomas P. Stafford, commander; John W. Young, command module pilot; and Eugene A. Cernan, lunar module pilot. The eight-day, lunar orbit mission will mark the first time the complete Apollo spacecraft has operated around the moon and the second manned flight for the Lunar Module (LM). Two Apollo 10 astronauts, Stafford and Cernan, are scheduled to descend to within eight nautical miles of the moon's surface in the LM. 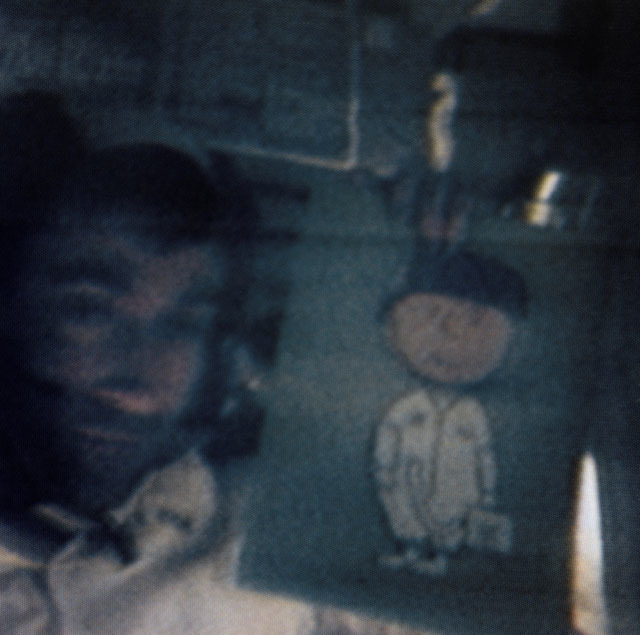 S69-34075 (19 May 1969) --- Astronaut John W. Young, Apollo 10 command module pilot, displays a drawing of Charlie Brown in this color reproduction taken from the fourth telecast made by the color television camera aboard the Apollo 10 spacecraft. When this picture was made the Apollo 10 spacecraft was about halfway to the moon, or approximately 112,000 nautical miles from Earth. "Charlie Brown" will be the code name of the Command Module (CM) during Apollo 10 operations when the Lunar Module (LM) and CM are separated. The LM's code name will be "Snoopy". Also, aboard Apollo 10 were astronauts Thomas P. Stafford, commander; and Eugene A. Cernan, lunar module pilot. 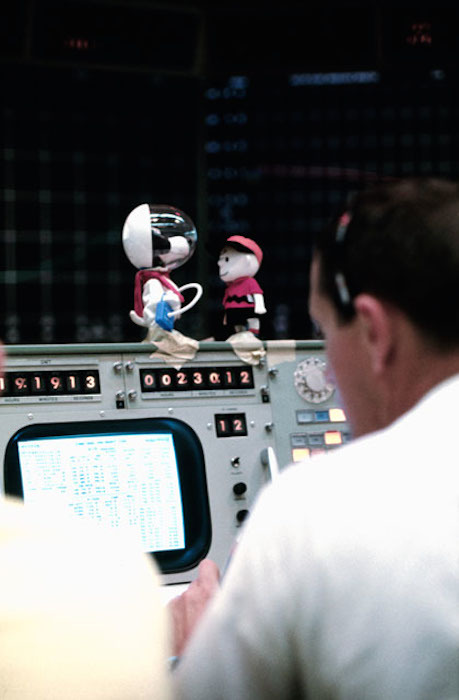 S69-34314 (18 May 1969) --- Replicas of Snoopy and Charlie Brown, the two characters from Charles Schulz's syndicated comic strip, "Peanuts," decorate the top of a console in the Mission Operations Control Room in the Mission Control Center, Building 30, on the first day of the Apollo 10 lunar orbit mission. During lunar orbit operations, the Lunar Module will be called "Snoopy" when it is separated from the Command and Service Modules. 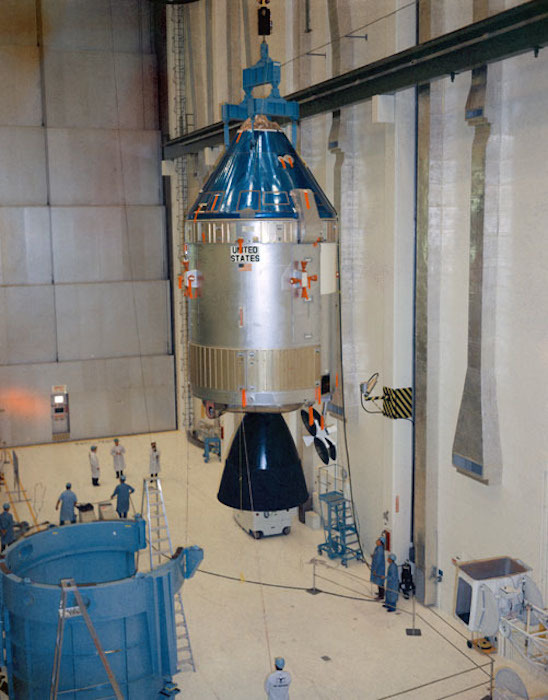 The code words for the Command Module will be "Charlie Brown". 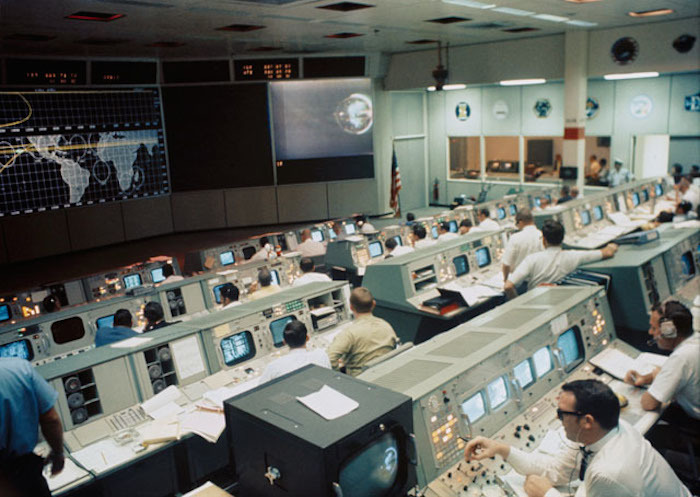 S69-34316 (18 May 1969) --- Overall view of the Mission Operations Control Room in the Mission Control Center, Building 30, on the first day of the Apollo 10 lunar orbit mission. A color television transmission was being received from Apollo 10. This picture was made following Command and Service Module/Lunar Module/Saturn IVB (CSM/LM-S-IVB) separation and prior to LM extraction from the S-IVB. The CSM were making the docking approach to the LM/S-IVB. 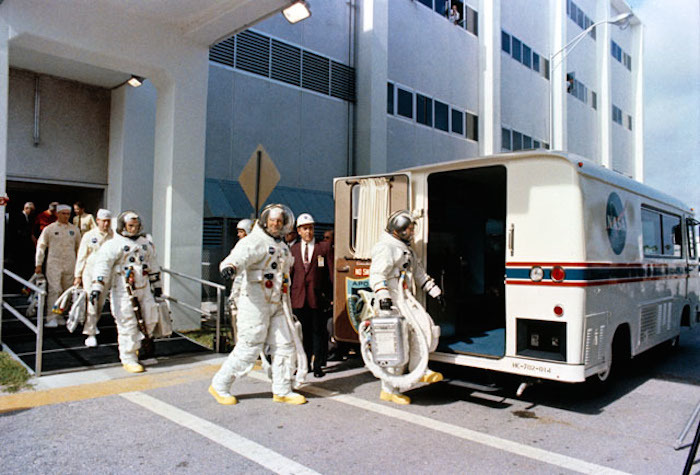 S69-35315 (18 May 1969) --- The Apollo 10 crew leaves the Kennedy Space Center's Manned Spacecraft Operations Building during the Apollo 10 prelaunch countdown. 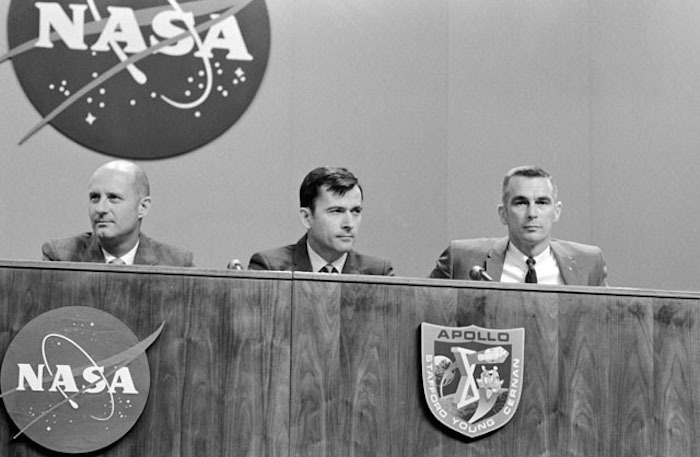 Leading is astronaut John W. Young, command module pilot, followed by astronauts Thomas P. Stafford, commander; and Eugene A. Cernan, lunar module pilot. The transfer van carried them over to Pad B, Launch Complex 39, where their spacecraft awaited them. 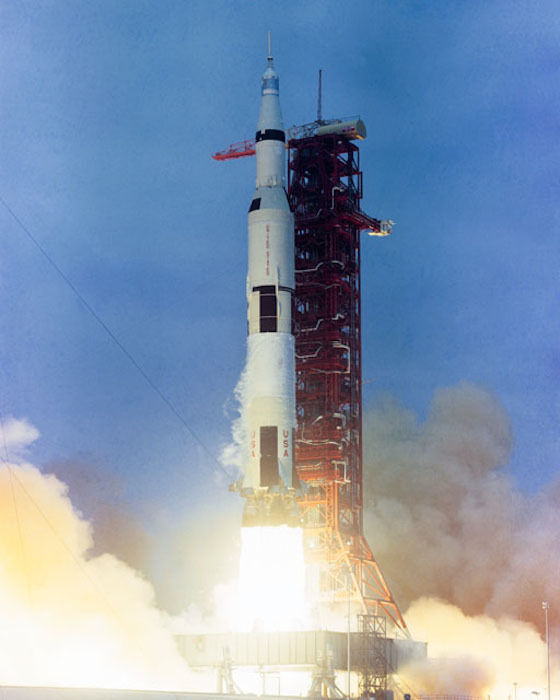 Liftoff for the lunar orbit mission was at 12:49 p.m. (EDT), May 18, 1969. 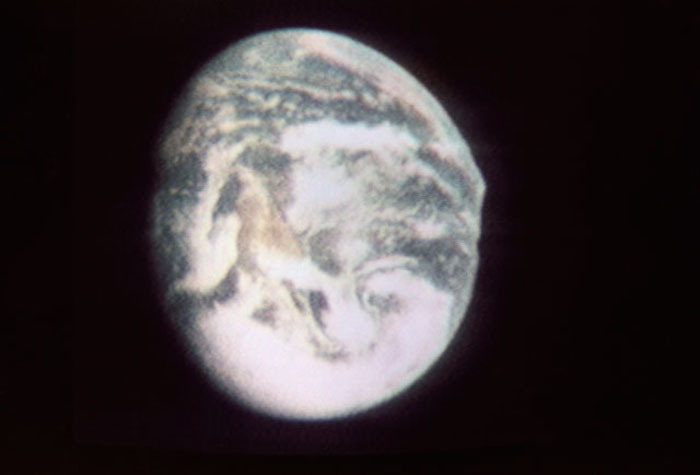 S69-33995 (18 May 1969) --- A cloud-covered Earth from about 12,800 nautical miles away is seen in this color reproduction taken from the second TV transmission made by the color television camera on board the Apollo 10 spacecraft. The United States and Mexico are located at right center. The more cloud-free area is the western and southwestern part of the U.S. and northern Mexico. Clouds cover the eastern half of the U.S. Aboard the Apollo 10 spacecraft on its trans-lunar course toward the moon were astronauts Thomas P. Stafford, commander; John W. Young, command module pilot; and Eugene A. Cernan, lunar module pilot. 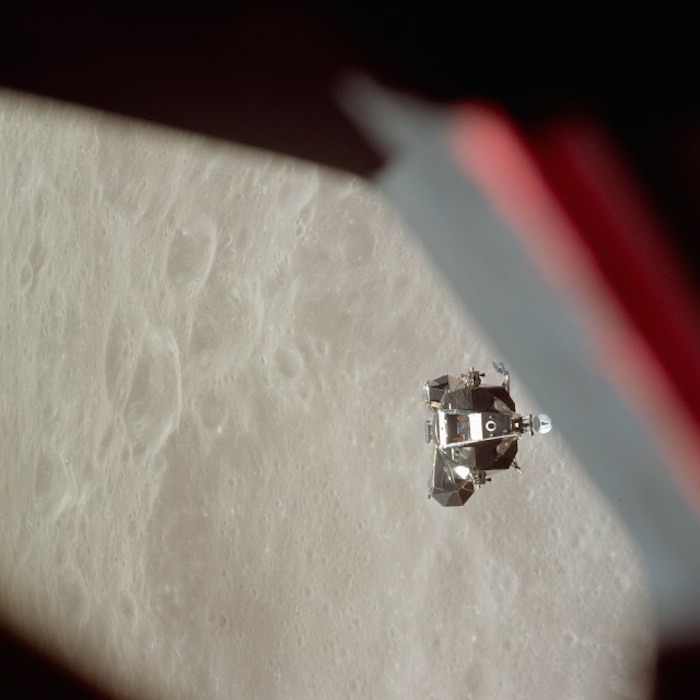 AS10-27-3873 (22 May 1969) --- The Apollo 10 Command and Service Modules (CSM) are photographed from the Lunar Module (LM) after CSM/LM separation in lunar orbit. The CSM was about 175 statute miles east of Smyth's Sea and was above the rough terrain which is typical of the lunar farside. The eastward oblique view of the lunar surface is centered near 105 degrees east longitude and 1 degree north latitude. The horizon is approximately 600 kilometers (374 statute miles) away. Numerous bright craters and the absence of shadows show that the sun was almost directly overhead when this photograph was taken. AS10-31-4650 (18-26 May 1969) --- This Apollo 10 oblique telephoto view of the lunar nearside is centered on the crater Hyginus located at 6.3 degrees north latitude, near the northeast margin of Central Bay. HOLD PICTURE WITH SKY AT TOP. The crater is about 10 kilometers (6.5 statue miles) in diameter. From the crater the prominent Hyginus Rille extends east-southeast toward the camera and northwest toward the Sea of Vapors. The rille is about 3 kilometers (2 statue miles) wide and more than 200 kilometers (130 statue miles) long. The horizon is not visible in this photograph, taken from the Command and Service Modules. The sunrise terminator is between the spacecraft and the horizon. At the time this picture was taken Apollo 10 was 325 kilometers (200 statute miles) southeast of Hyginus. AS10-27-3907 (18-26 May 1969) --- Apollo 10 westward view across Apollo Landing Site 3 in the Central Bay. Apollo Landing Site 3 is in the middle distance at the left margin of the pronounced ridge in the left half of the photograph. 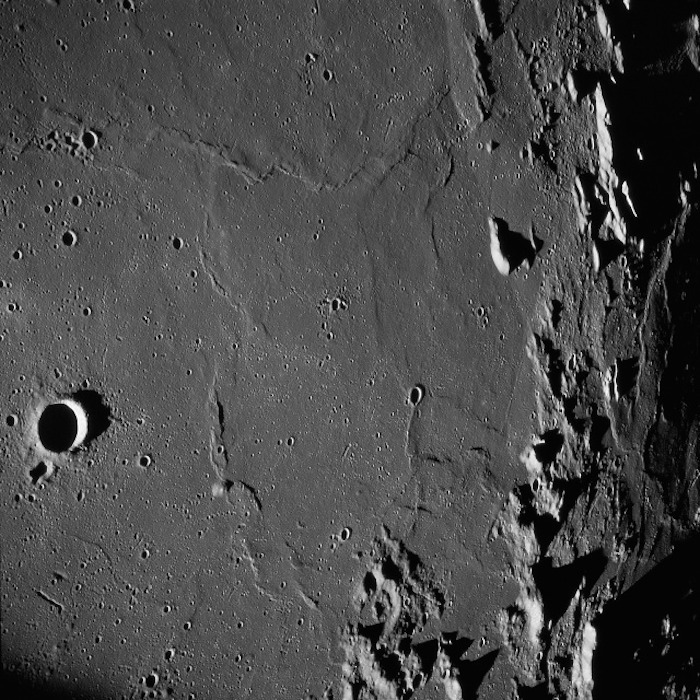 Bruce, the prominent crater, near the bottom of the scene, is about 6 kilometers (3.7 statute miles) in diameter. Topographic features on the surface of the Central Bay are accentuated by the low sun angle. Sun angles range from near 6 degrees at the bottom of the photograph to less than one degree at the top. 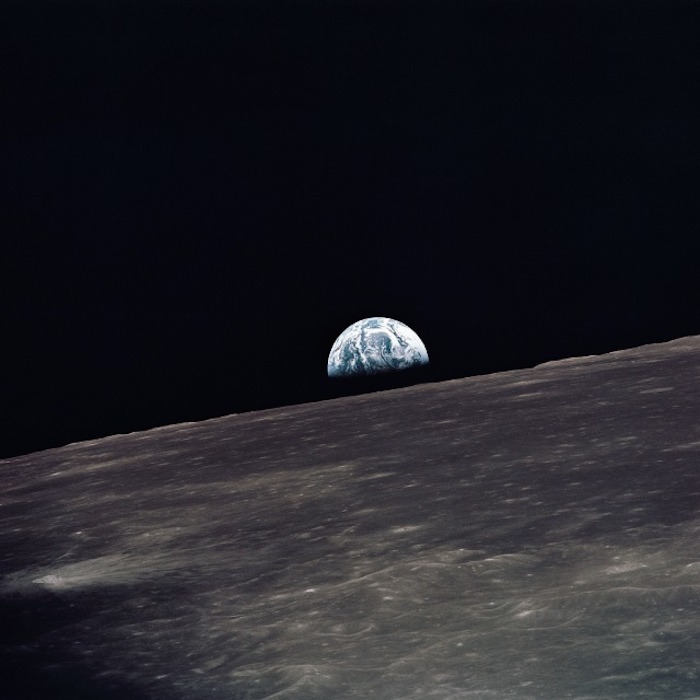 AS10-27-3890 (18-26 May 1969) --- A view of Earth rising above the lunar horizon photographed from the Apollo 10 Lunar Module, looking west in the direction of travel. The Lunar Module at the time the picture was taken was located above the lunar farside highlands at approximately 105 degrees east longitude. AS10-32-4819 (18-26 May 1969) --- An Apollo 10 northwestward oblique view of Triesnecker crater, centered near 3.6 degrees east longitude, and 4 degrees north latitude. HOLD PICTURE WITH SKY AT UPPER RIGHT. This picture, taken from the Command and Service Modules, shows terrain features typical of northeastern Central Bay. Beyond the highlands, the smooth floor of the Sea of Vapors extends almost to the horizon some 600 kilometers (375 statute miles) from the spacecraft. 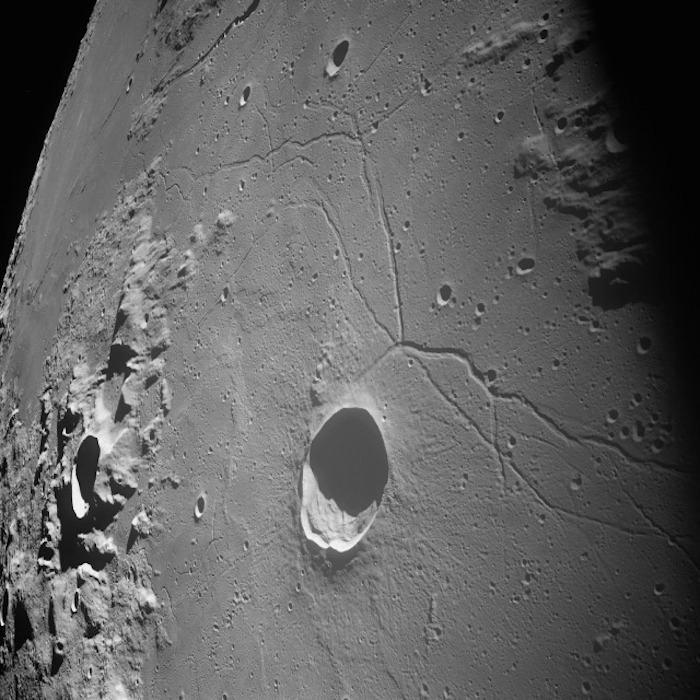 Triesnecker crater, about 27 kilometers (17 statute miles) in diameter, was 135 kilometers (85 statute miles) northwest of Apollo 10 when the picture was taken. 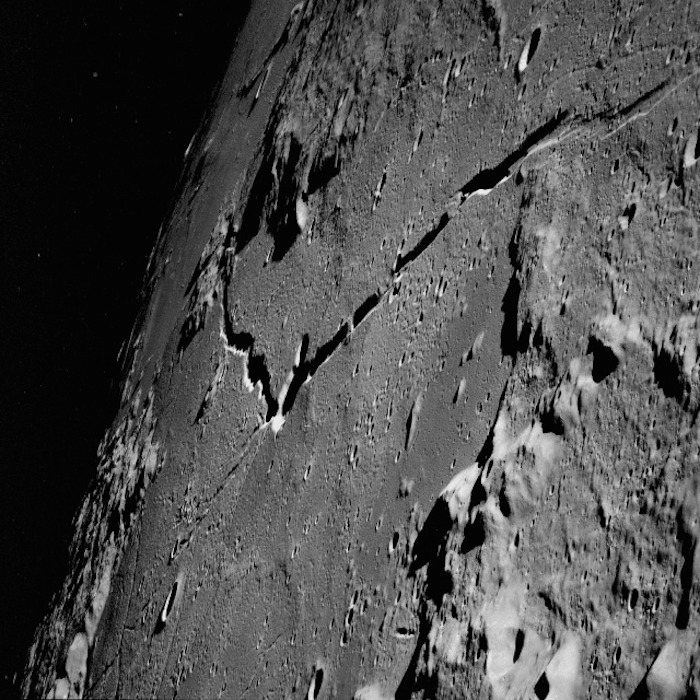 The intersecting linear features to the right of Triesnecker crater are the Triesnecker Rilles. 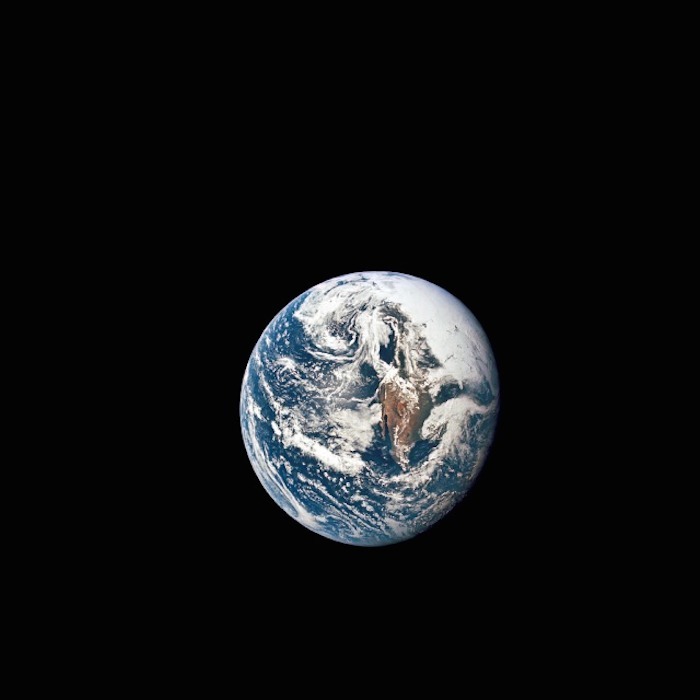 AS10-34-5013 (18 May 1969) --- A view of Earth from 36,000 nautical miles away as photographed from the Apollo 10 spacecraft during its trans-lunar journey toward the moon. While the Yucatan Peninsula is obscured by clouds, nearly all of Mexico north of the Isthmus of Tehuantepec can be clearly delineated. The Gulf of California and Baja California and the San Joaquin Valley can be easily identified. Also, the delta of the Rio Grande River and the Texas coast are visible. Note the color differences (greens - east, browns - west) along the 100 degrees meridian. The crew members on Apollo 10 are astronauts Thomas P. Stafford, commander; John W. Young, command module pilot; and Eugene E. Cernan, lunar module pilot. 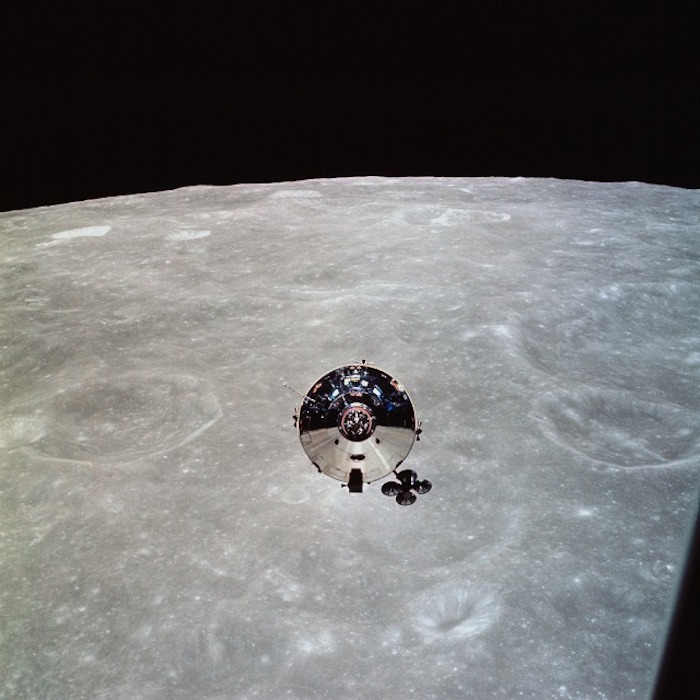 Astronaut Young remained in lunar orbit, in the Command and Service Modules (CSM) "Charlie Brown", while astronauts Stafford and Cernan descended to within nine miles of the lunar surface, in the Lunar Module (LM) "Snoopy". 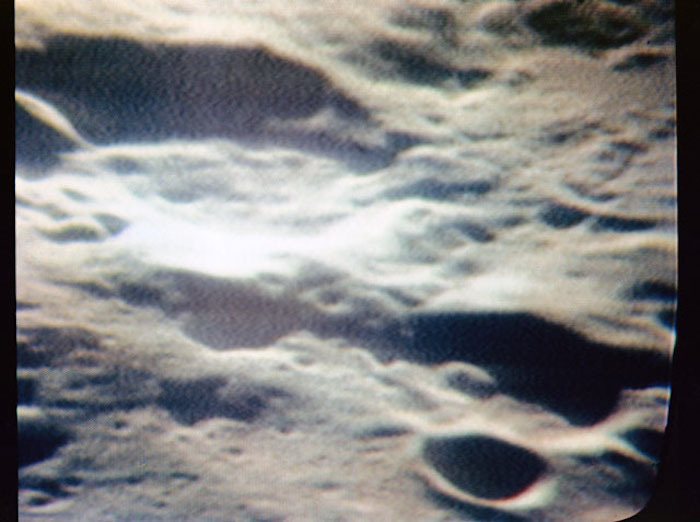 S69-33993 (18 May 1969) --- The Apollo 10 Lunar Module, still attached to the Saturn IVB stage, is seen in this color reproduction taken from the first television transmission made by the color television camera aboard the Apollo 10 spacecraft. This picture was made following CSM/LM-S-IVB separation, and prior to LM extraction from the S-IVB. The Command and Service Modules were making the docking approach to the LM/S-IVB. The circular object is the docking drogue assembly on the LM. Aboard the Command Module were astronauts Thomas P. Stafford, commander; John W. Young, command module pilot; and Eugene A. Cernan, lunar module pilot. 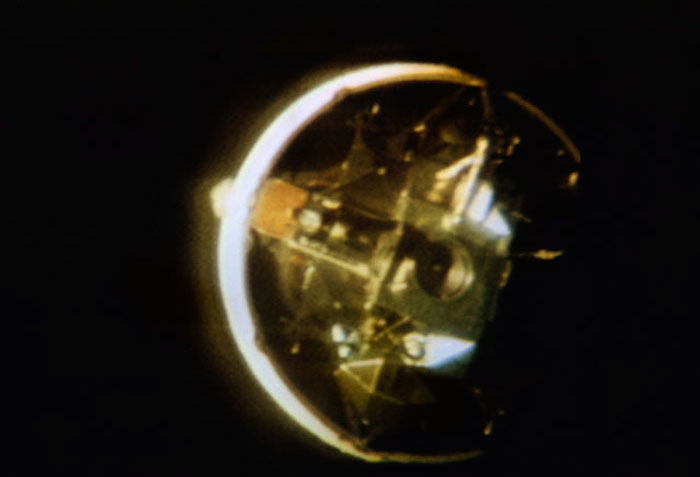 S69-33994 (18 May 1969) --- The Apollo 10 Lunar Module, still attached to the Saturn IVB stage, is seen in this color reproduction taken from the first television transmission made by the color television camera aboard the Apollo 10 spacecraft. This picture was made following CSM/LM-S-IVB separation, and prior to LM extraction from the S-IVB. The Command and Service Modules were making the docking approach to the LM/S-IVB. The circular object is the docking drogue assembly on the LM. Aboard the Command Module were astronauts Thomas P. Stafford, commander; John W. Young, command module pilot; and Eugene A. Cernan, lunar module pilot. AS10-34-5085 (18-26 May 1969) --- The Apollo 10 Lunar Module is photographed from the Command and Service Modules. 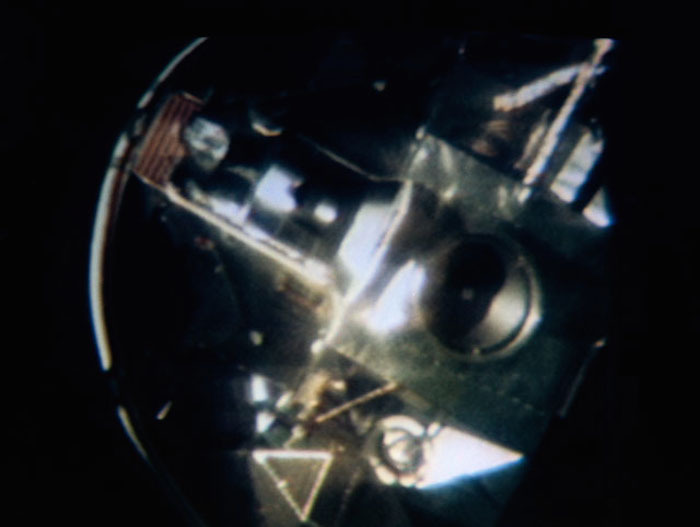 This view of the LM is partially obscured by the blue reflection of a portion of an astronaut's suit and a part of the Command Module's control panel in the window. The sun is shining on the bottom of the descent stage and on the bottom of the landing pads. This picture was taken during the inspection of the LM from the CSM. 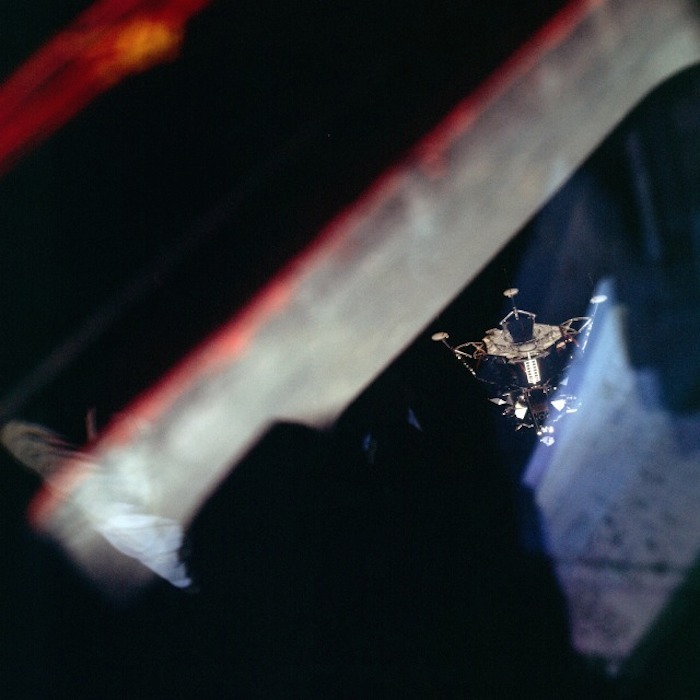 AS10-34-5112 (26 May 1969) --- The ascent stage of the Apollo 10 Lunar Module (LM) is photographed from the Command Module prior to docking in lunar orbit. The LM is approaching the Command and Service Modules from below. The LM descent stage had already been jettisoned. The lunar surface in the background is near, but beyond the eastern limb of the moon as viewed from Earth (about 120 degrees east longitude). The red/blue diagonal line is the spacecraft window. 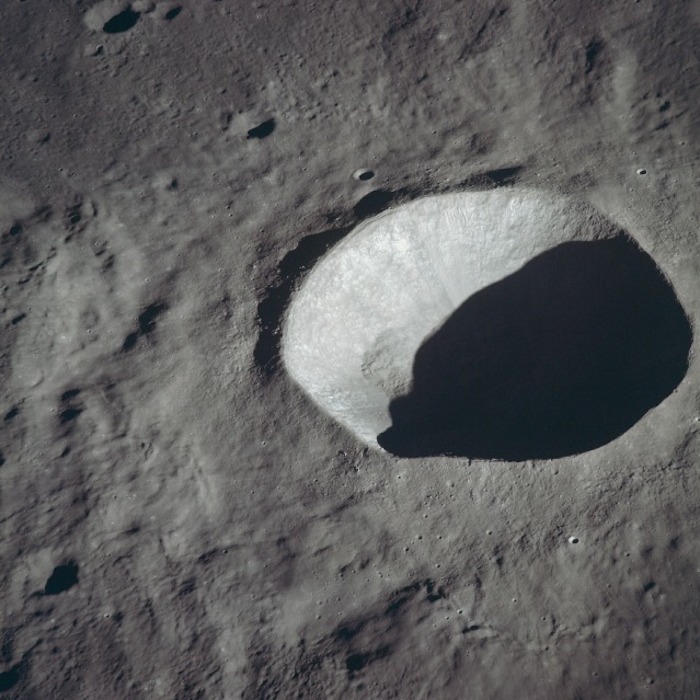 AS10-34-5162 (18-26 May 1969) --- An Apollo 10 view of crater Schmidt which is located at the western edge of the Sea of Tranquility. Schmidt, which has a diameter of 7 statute miles, is also located just south of the crater Ritter and immediately west of the crater Sabine. The coordinates of Schmidt are 18.8 degrees east longitude and 1.2 degrees north latitude. The shadowed area is on the east side of the crater. AS10-34-5173 (18-26 May 1969) --- An Apollo 10 photograph of the lunar farside showing an area in the vicinity of International Astronomical Union (I.A.U.) crater No. 300, taken from the Command and Service Modules. 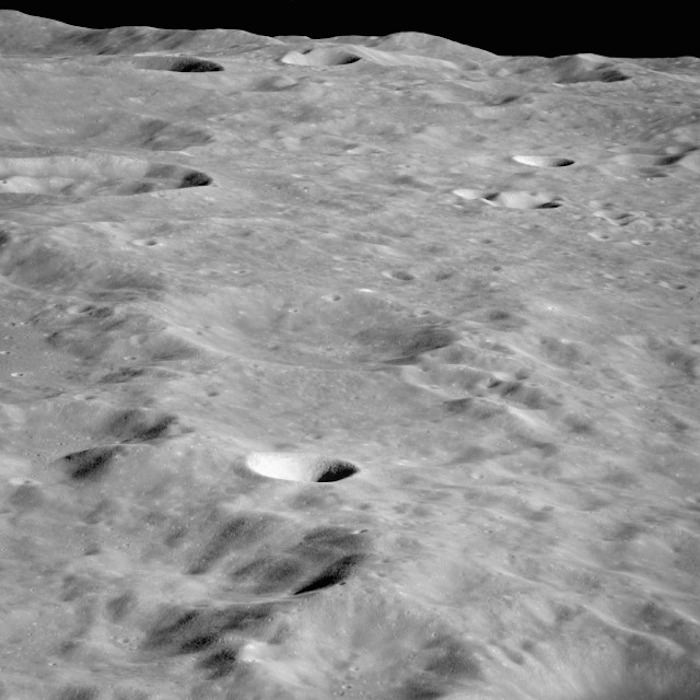 This view is looking south over typical rugged lunar terrain. I.A.U. crater No. 300 is located at 155 degrees east longitude and 10 degrees south latitude. 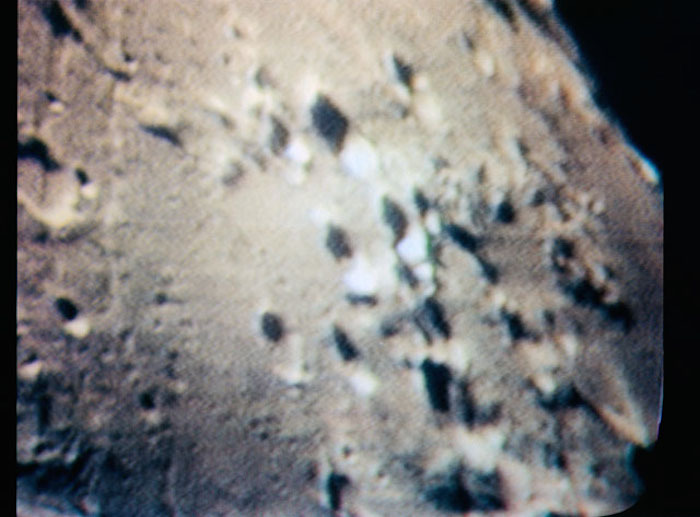 S69-34476 (21 May 1969) --- An oblique view of a group of craters just west of the Sea of Fertility (Mare Fecunditatis) on the lunar nearside is seen in this color reproduction taken from a telecast made by the color television aboard the Apollo 10 spacecraft as it orbited the moon. 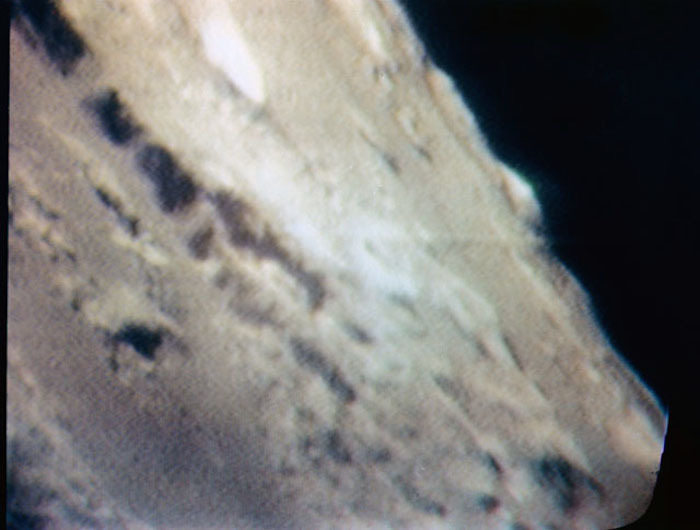 In this area are Gutenberg I, Capella A, Capella D, Capella E, and Capella M.
S69-34478 (21 May 1969) --- An oblique view of Barbara Mesa on the lunar nearside is seen in this color reproduction taken from a telecast made by the color television camera aboard the Apollo 10 spacecraft as it orbited the moon. This area is located generally east of Maskelyne crater on the southern edge of the Sea of Tranquility (Mare Tranquillitatis). Barbara Mesa is located at about 32 degrees 45 minutes east longitude and 1 degree 45 minutes north latitude. S69-34479 (21 May 1969) --- The crater Gutenberg area on the lunar nearside is seen in this color reproduction taken from a telecast made by the color television camera aboard the Apollo 10 spacecraft as it orbited the moon. Gutenberg is located at 41 degrees 30 minutes east longitude, and 8 degrees 30 minutes south latitude. 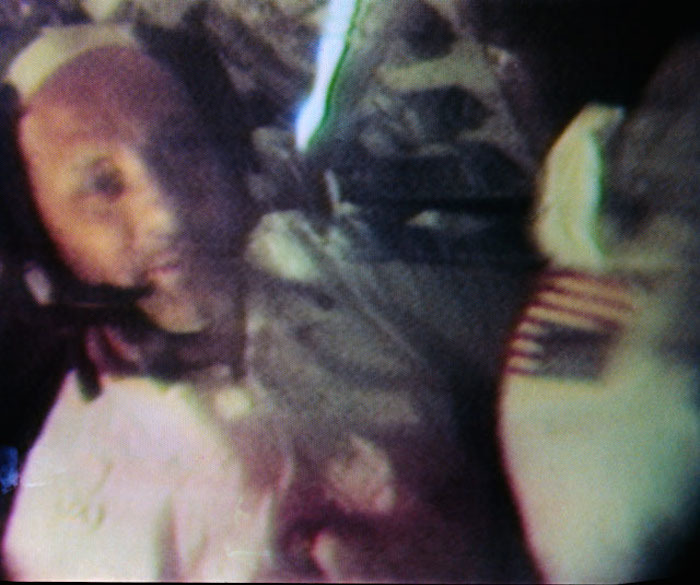 S69-34969 (24 May 1969) --- Astronaut Thomas P. Stafford, Apollo 10 commander, is seen in this color reproduction taken from a telecast made by the color television camera aboard the Apollo 10 spacecraft during its trans-Earth journey home. S69-36594 (26 May 1969) --- The Apollo 10 spacecraft, with astronauts Thomas P. Stafford, John W. Young and Eugene A. Cernan onboard, approaches touchdown in the South Pacific recovery area to conclude a successful eight-day lunar orbit mission. Splashdown occurred at 11:53 a.m. (CDT), May 26, 1969, about 400 miles east of American Samoa, and about four miles from the prime recovery ship, USS Princeton. S69-36595 (26 May 1969) --- Astronauts Thomas P. Stafford, Apollo 10 commander; and John W. Young, command module pilot, await pickup by the recovery helicopter from the prime recovery ship, USS Princeton. Astronaut Eugene A. Cernan, lunar module pilot, is already hoisted aboard the helicopter. U.S. Navy underwater demolition team swimmers assist in the recovery operations. 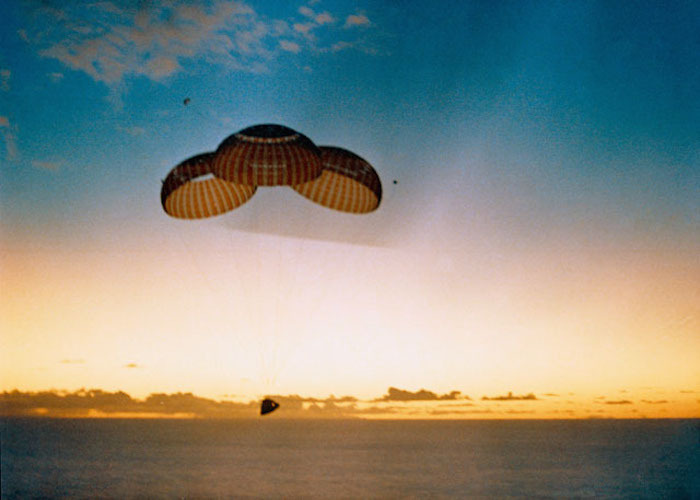 Splashdown occurred at 11:53 a.m., May 26, 1969, about 400 miles east of American Samoa and about four miles from the recovery ship, to conclude a successful eight-day lunar orbit mission. 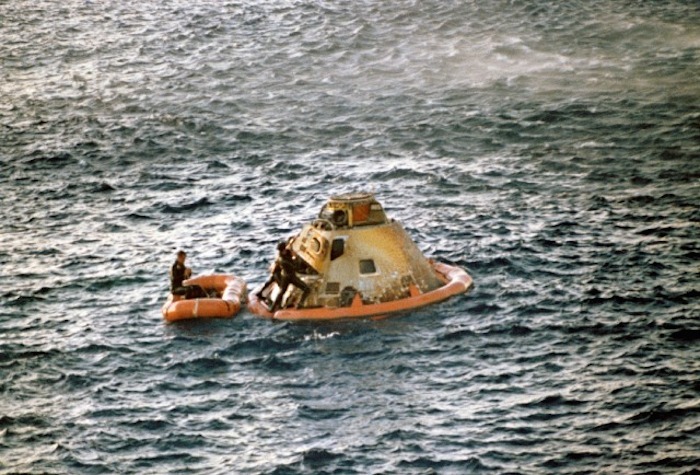 S69-36592 (26 May 1969) --- The Apollo 10 spacecraft, with astronauts Thomas P. Stafford, John W. Young, and Eugene A. Cernan still inside, floats in the South Pacific immediately after splashdown. U.S. Navy underwater demolition team swimmers assist in the recovery operations. 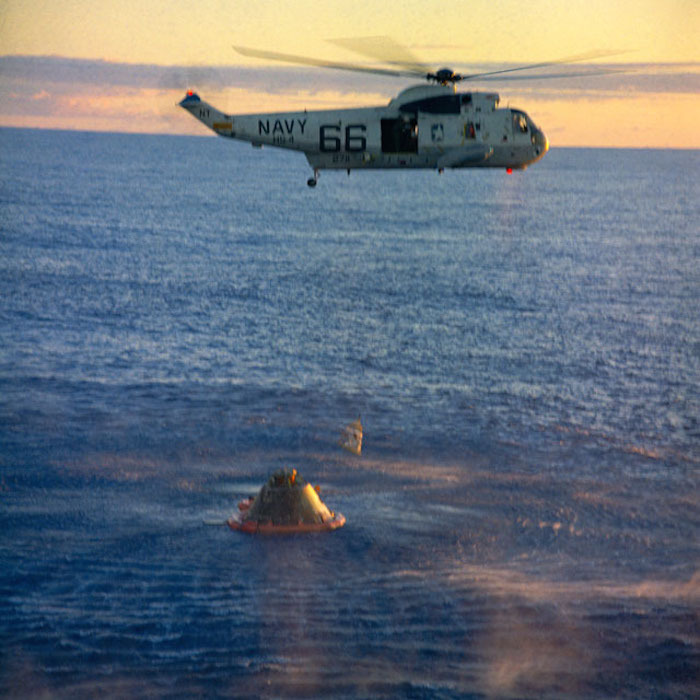 Splashdown occurred at 11:53 a.m. (CDT), May 26, 1969, about 400 miles east of American Samoa and about four miles from the prime recovery ship, USS Princeton, to conclude a successful eight-day lunar orbit mission. S69-21037 (26 May 1969) --- A member of the Apollo 10 crew is hoisted up to a helicopter from the prime recovery ship, USS Princeton. Splashdown occurred at 11:53 a.m., May 26, 1969, about 400 miles east of American Samoa. S69-36806 (7 June 1969) --- The prime crew of the Apollo 10 lunar orbit mission participates in a postflight press conference in the Manned Spacecraft Center Auditorium on June 7, 1969. Left to right, are astronauts Thomas P. Stafford, commander; John W. Young, command module pilot; and Eugene A. Cernan, lunar module pilot.